Dhaka, Oct 19 (Just News): Newly formed Jatiya Oikyafront on Friday deferred its maiden public rally in Sylhet to October 24 as it was denied permission to hold the programme on October 23. “We’d sought permission for holding our rally in Sylhet on October 23, but the government didn’t permit us. We’ve now decided to hold the programme on October 24,” Gano Forum general secretary Mostafa Mohsin Montu told reporters on Friday evening after a meeting of senior leaders of the new alliance. He said they hope the government will give them permission within a day or two to hold the public rally. Montu, however, said the meeting decided that the Oikyafront leaders will go to Sylhet on October 24 even if they are not given permission to stage their rally. 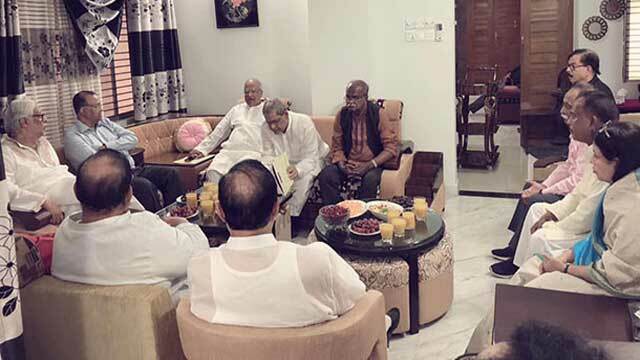 The meeting that began around 4pm at Oikyafront and Nagorik Oikya leader Mobarak Hossain’s Dhanmondi residence continued for nearly three hours. Montu said senior Oikyafront leaders will offer fateha at the shrines of Hazrat Shahjalal (R) and Shah Paran (R) and at the grave of General MAG Osmani, the commander-in-chief of the Armed Forces during the War of Liberation, in Sylhet on October 24, and then hold the public rally in the city. Besides, he said, they will go to Chattogram on October 27 and hold a rally there the same day. Montu said they have already sought permission from the authorities concerned to hold the rally in Chattogram city. Before going to Chattogram, he said, they will exchange views with different professionals in the capital on October 26. The Oikyafront leader said the meeting also formed a coordination committee and a steering one of the alliance. He said two leaders of each Oikyafront components are kept there in the coordination committee while the steering one was formed with the top most leaders of all parties. BNP secretary general Mirza Fakhrul Islam Alamgir, standing committee members Khandaker Mosharraf Hossain and Moudud Ahmed, JSD vice-president Tania Rob, general secretary Abdul Malek Ratan, Nagorik Oikya convener Mahmudur Rahman Manna, Gano Forum executive president Subrata Chowdhury, Dr Zafrullah Chowdhury and former vice-president of Dhaka University Central Students' Union (Ducsu) Sultan Mohammad Mansur Ahmed were present at the meeting.